An exhibition of the artist Hristo Popov “Brazil in Caricatures” is opening October 23rd, 2006, at 5.30 PM, at the Plovdiv Ethnographic Museum . 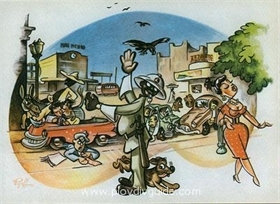 These are caricatures drawn in 1953 while the artist was in Brazil. After exhibiting them at the Ethnographic Museum here, they will be moved to Gabrovo, where they will be exhibited at the Humor and Satire Center there. *On the picture - one of the caricatures in the exibition -"Who is guilty?"